Torwood Lounge. Southern Sydney's most elegant reception centre. From the minute you enter Torwood Lounge, you will experience the warm, friendly ambience that is important for a memorable wedding / function. Designed as a luxurious venue, the décor creates an intimate atmosphere, a mood of relaxed sophistication, perfect for any reception. With huge crystal chandeliers, rich teak dance floor and a spacious yet stylish setting, Torwood Lounge offers the exceptional. Torwood Lounge is managed and operated by the owners, Robert & Reema Katrib, offering a personalised service, with all inclusive packages. 'NO-COST-MOST-EXTRAS' and certainly no unpleasant surprises! Fabulous food, attention to detail and a feeling of space and refinement, make the Torwood Lounge Function Centre a truly exceptional experience. At Torwood Lounge, we recognise that each wedding / function is unique. For a no obligation visit, please contact us. 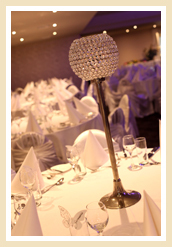 Torwood Lounge, a wedding reception centre like no other reception centres, see for yourself.